I took a mini vacay from blogging last week, so this is a double edition of the Roundup. I swear this is still my favorite part of this blog because you people really make some good stuff. Half of my list of recipes to try (see left hand sidebar) is from you guys and the other half is from Rachael's magazine, with a few talk show ones sprinkled in (many of those aren't as quick). I think I have enough recipes there to last me for a very long time! Krista of Krista Kooks made Cheddar Soup with Tortilla Crunchies and reminded me that I really need to start cooking out of my cookbooks again instead of just from Rachael's magazine and talk show! She also made Elsa's Beef and Burgundy. Check out this video where Rachael Ray gives her support to Chicago's bid for the Olympics. 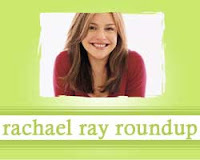 Popeater has an interview with Rachael Ray where she talks about the new season of her talk show and her long days. Deborah of Taste and Tell made Zucchini Spaghetti with Saffron Sauce and reworked Rachael's recipe for Spicy Thai Chicken. Angie of Food Musings made Panzanella Salad with Salami from Every Day with Rachael Ray. Ashley of Make it and Love it ushered in Fall by making Rachael's Pumpkin and Sausage Pasta. Shelley of Shelley Bakes made Grilled Ratatouille. Gina of The Candid RD made Pomegranate and Walnut Chicken from Every Day with Rachael Ray. Get in the Kitch features a review of Rachael's recipe for Spinach Artichoke Whole Wheat Penne. Sherri of Yum made Beef Fajita Burgers. Natashya of Living in the Kitchen with Puppies adapted Rachael's recipe for Meatball Subs and used homemade Kaiser rolls. Quinn of Everything in Moderation made Grilled Summer Corn-and-Chipotle Chowdah from Every Day with Rachael Ray. Sweet Cheeks freatures a review of Pumpkin Whoopie Pies. Wondering aloud what may have come of the restaurant she was supposed to be opening in NYC by the end of this year. ? Ya know, I haven't heard anything about that lately.... I'll keep an eye out.